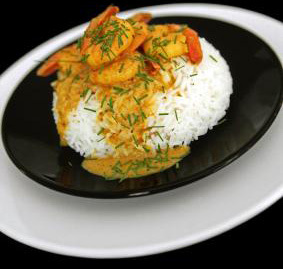 This is a quick and simple shrimp dish that promises to delight the tastebuds of every "curry" lover. Magic is made when this seafood is fused with the authentic taste of JCS Real Jamaican Curry. In a pot, add chopped onions and JCS garlic/escallion to oil. Add JCS Curry powder to the mix and lightly stir. After approximately 2 minutes, add shrimp, salt, black pepper and JCS crushed scotch bonnet pepper sauce. Cook shrimp for roughly 5 mins. Mix well. Let simmer. Serve hot with white rice and a tossed salad.